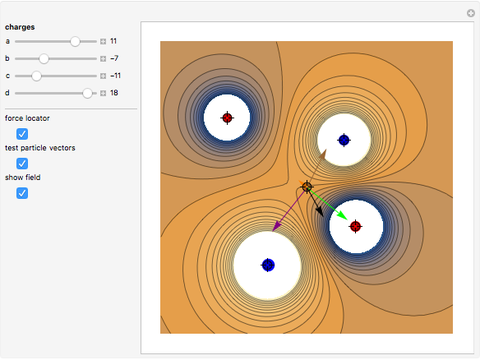 Altering the strength, sign, or location of the four point charges creates a unique electric field. The strength of the electric field produced by a single point charge is calculated with the equation , where is Coulomb's constant (about ), is the charge of the particle, and is the distance. By combining all the forces, a net field can be found. Drag the "force locator" to see the net force and individual forces for a specific point. 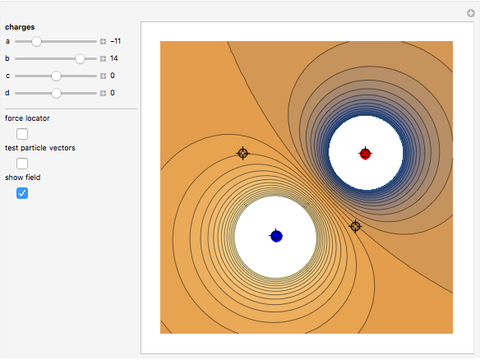 Click anywhere in the test area to drop a test particle (positively charged) and watch its behavior. If the "test particle vectors" option is checked, vectors that show the forces acting on the test particle are shown as the test moves through the field. 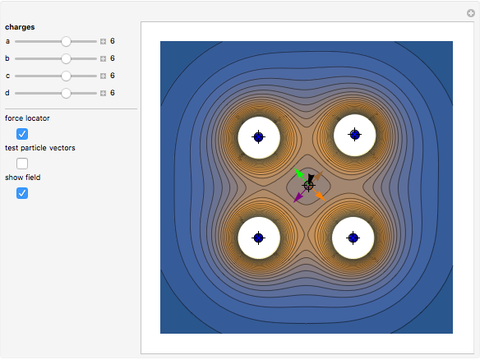 Check the "show field" option to see the electric field for the entire test area. Mark Peterson "Dropping a Test Charge into an Electric Field"